Poly-lysine is a synthetic positively charged polymer, existing as two enantiomers, poly-D-lysine (PDL) and poly-L-lysine (PLL). Both are commonly used however poly-D-lysine is not degraded by cellular proteases and is therefore often the preferred choice. As poly-D-lysine is a synthetic protein, it does not influence the signaling pathways of the cells and is completely free of any animal contaminants. This polyamino acid is useful in promoting cell adhesion to solid substrates and enhances electrostatic interaction between negatively-charged ions of the cell membrane and positively-charged surface ions of attachment factors on the culture surface. When adsorbed to the polystyrene surface, poly-D-lysine increases the number of positively-charged sites available for cell binding. This uniform net positive charge is preferred by certain cell types and can subsequently enhance cell attachment, growth and differentiation of these cell types, especially under serum-free and/or low serum conditions. Poly-D-lysine coated surfaces often improve attachment and growth of primary neurons, glial cells, neuroblastomas, and a variety of transfected cell lines. 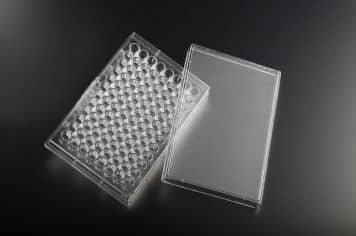 In addition, these coated surfaces are often used to reduce cell detachment that often occurs during multiple washing steps that are associated with cell-based assays. Poly-D-Lysine (M.W. 70-150 kDa) is coated using 200 µl/well. The microplates, if unopened, are sterile and stable refrigerated until the expiration date printed on the label.